Updated: 02/04/13 -- Added WeakAuras Imports URL. Updated: 02/01/13 -- Added Tank/Construct Video Guide. Updated: 01/31/13 -- Added "Strategy 4: Sustained Tank-Construct, Destabilize Un’sok and Monstrosity w/ 3 Tanks." Updated: 01/31/13 -- Added "Addendum: Tank-Construct Guide" section. The number of new abilities or altered mechanics between Heroic and Normal are few and far between, but those differences that do exist are dramatic and drastically impact the encounter. The most important change introduced in Heroic difficulty deals with the Living Amber spawns. As with Normal Difficulty, Living Amber spawn four at a time from Amber-Shaper Un’sok’s Amber Scalpel attack, which is cast on a random raid member every 50 seconds. Like Normal, Living Ambers on Heroic can be killed and upon death, create an Amber Pool at their location, which can be Consumed by a Constructed player at any time. However, the key factor is that on Heroic, once an Amber Pool has been active for 30 seconds, it will reconstitute itself into the previous Living Amber form, soaking and destroying the pool and recreating a Living Amber to once again attack the raid. Therefore, this single mechanical change dramatically impacts the manner in which the raid must handle Living Amber spawns and the Amber Pools created therein, as any Pools not Consumed rapidly by a currently Constructed player will quickly reform and be a threat to the raid once again. With the addition of four new Living Amber every 50 seconds from Amber Scalpel, the raid can very swiftly become overwhelmed by Living Amber duties if a sound Amber management strategy is not implemented throughout the encounter. Regardless of the specific strategy you elect to implement for the Heroic Amber-Shaper Un’sok encounter, inevitably all methods revolve around the singular notion of managing energy for the Constructed players throughout the fight. Therefore it is worth taking a moment to go over the numerics behind Construct energy and how they affect the timing and potential strategies your raid can utilize during the encounter. This of course means that any Constructed player that does not Consume any Amber Pools will be alive for a maximum of 38 seconds before he or she is forced to leave. This extra time given for each Amber Pool Consumed is not exact and varies slightly based on whether the Construct must interrupt his or her Amber Explosion during this period, thereby consuming an extra 8 energy. However, the average time added per pool of 7.6 seconds is accurate over the course of the encounter, and can be useful knowledge in certain events, such as when a single Constructed player needs to interrupt the Amber Monstrosity’s Amber Explosion cast within the next few seconds, but the Construct energy total is so low it will force the player to leave before the interrupt time occurs. Consuming a single puddle for an extra 7 seconds or so may be enough time to allow that interrupt to occur and prevent a raid wipe. Therefore, if desired, each new Constructed player can easily remain active for the entire 50-second duration of that Reshape Life/Amber Scalpel “round” with 18 seconds of overlap until the next Construct is created. This means the Constructed player would run out of energy 29.4 seconds into the current Reshape Life “round”, which is a good 17-18 seconds ahead of the next Amber Scalpel cast. Knowing all the details behind Construct energy usage allows one to put that knowledge into practice in a few different strategies for this encounter. The next big factor to consider when strategizing for this encounter is the mechanics and usage of Amber Strike, the primary (#1) ability used by Constructed players throughout the fight. Just like Normal difficulty, this ability can be used on any target every 6 seconds and in addition to dealing a large chunk of damage, it most importantly will apply the stacking Destabilize debuff. Destabilize lasts 15 seconds and increases the damage taken by the target by 10% per stack, stacking near-infinitely. The point of vital importance for Heroic Amber-Shaper is that Amber Strike can be utilized on Un’sok himself during Phase 2 of the encounter, even when the boss is immune to damage. While the damage component of Amber Strike will fail to do anything during this period, the Destabilize debuff will still connect and stack up on Amber-Shaper Un’sok while he is immune, and this sole fact is the driving force behind the vast majority of Heroic strategies used on this encounter to date. The reason this tactic is important is due to the very harsh mechanics of Phase 3, allowing the raid to enter the final Phase with a pre-existing stack of the Destabilize debuff on Un’sok and therefore deal obscene amounts of DPS to the boss well before the raid would “normally” be able to under regular circumstances. The reasons for the difficulty of the third Phase will be covered in that section, but suffice to say most strategies will want to utilize some form of pre-stacking Destabilize on Un’sok prior to the start of Phase 3 for this purpose. Since the crucial aspects of this encounter almost entirely revolve around proper control of Construct abilities and energy, there are a handful of tips and best-practices that can prevent some headaches when put into use. First and foremost, nearly without exception, all actions of a Constructed player should be done with the mindset of working around the 6-second cooldown of Amber Strike. Every moment, the Constructed player should be considering how soon Amber Strike will come off of cooldown and plan ahead to be in position of his or her primary Amber Strike target at that moment. Regardless of the strategy employed by the raid, the more judiciously Amber Strike is used on cooldown, the better chance that Destabilize will remain active on the intended target(s) during the encounter. Not only is this incredibly important for DPS purposes, but in most strategies, maintaining Destabilize properly is required and failing to do so demands a purposeful wipe for the raid. Therefore, the best practice for Constructed players is to deal with non-Amber Strike tasks in the interim 4-5 seconds of downtime between Amber Strike cooldowns. This includes movement away from and back into melee range of the primary target as well as Amber Pool Consumptions. The self-interrupts via Struggle for Control cannot be intentionally timed in most cases, so performing an interrupt takes precedence over exact on-cooldown Amber Strike usage, but everything else should be revolving around this ability being utilized at every opportunity. Second, if a Construct is Consuming Amber Pools, regardless of the number being Consumed, it is best to do so earlier in his or her Constructed phase rather than later. This will benefit DPS players who are attempting to bring the Construct’s health below the escape-level of 20%. Consider that every Amber Pool Consumed increases current and maximum health of the Construct by 2 million hit points. If the Constructed player Consumes a Pool while at 15% health, this will invariably push his or her health beyond the 20% mark once again, and force DPS to re-engage the Construct to drop the health back below 20%. As with any DPS scenario, target swapping is a dramatic overall DPS loss in most cases. If energy is at or below 80, move to the furthest Pool and Consume. Move back into melee range of the primary target. The only exception to using Amber Strike on cooldown is of course for Constructed players during Phase 2 that are meant to interrupt Amber Explosion from the Amber Monstrosity. This ability is cast every 47 seconds, so one interrupt is required for each Reshape Life “round” during Phase 2. The cooldown is quite precise, so Constructed players should keep a very close eye on the timer of the upcoming Monstrosity Amber Explosion. Since players should be using Amber Strike on cooldown at all times except for this scenario, a simple system should be used to ensure Amber Strike is still utilized as frequently as possible while ensuring its availability to interrupt the Monstrosity. While the Monstrosity’s Amber Explosion cooldown has greater than 12 seconds remaining, Amber Strike on cooldown as normal. If the Amber Explosion cooldown is between 7 and 12 seconds remaining, use Amber Strike one final time then halt usage. Finally, Amber Strike the Monstrosity when Amber Explosion is cast. By performing one final Amber Strike anywhere within that 7-12 second window then halting use until the interrupting Amber Strike that will follow, the Constructed player can be assured that Destabilize will remain stacked on the Monstrosity while also managing the cooldown so Amber Strike is always available when the interrupt is required. Finally, albeit rare, occasionally the Monstrosity: Amber Explosion and the personal Construct: Amber Explosion will occur simultaneously, and this can often be a point of confusion for players about what to do. The basic rule is simple: React to whichever Explosion presented itself first. If they truly are simultaneous, then you should utilize Struggle for Control first, and then Amber Strike second. While the Monstrosity: Amber Explosion is far more dangerous than the Construct version, it seems that using Amber Strike > Struggle for Control can sometimes cause Struggle to fail to register properly in time, while flipping the order seems to always utilize both abilities, in spite of the slight “stun” that Struggle for Control causes. Since Amber Explosion has a 2.5 second cast, the Construct will break free of the stun before the Monstrosity finishes casting, allowing the follow-up Amber Strike to connect safely. Depending on the strategy your raid is using, you may find it necessary to ensure Un’sok is as low health as possible when he enters Phase 3. Usually this is around 65% as mentioned before, but this value can be lowered a good chunk by taking advantage of a simple fact: Un’sok will not cast the spell to summon the Monstrosity and start Phase 2 while he is in the middle of channeling another spell, such as Amber Scalpel or Reshape Life. Therefore, if timed properly, the raid can halt damage on Amber-Shaper Un’sok just above 70%, and wait for him to start casting Amber Scalpel and begin to burn him down. Amber Scalpel is a 10 second cast, and is always immediately followed by Reshape Life, which is another 2.5 second cast. This gives your raid a good 13-14 seconds of DPS time to attack Un’sok below 70% before he gains immunity entering Phase 2. Depending on the Destabilize stack at the time, you can get his health very low during this period, giving you a major leg up when going into Phase 3. This ability only deals slightly more damage on Heroic than on Normal (30,000 vs. 25,000 every 2 seconds), however given that other damage values are increased on Heroic, managing this can sometimes be tricky. The absolute best method to manage Parasitic Growth is with absorb effects. Absorbs do not seem to count toward the “healing received” portion of this debuff, therefore an early absorb can prevent the vast majority of damage dealt and in turn limit the actual healing requirement for an extended period. As with any such mechanic, early reduction is the key, so players should use self-cooldowns if they get this debuff, especially if unavoidable damage is expected (such as Living Amber pulses or explosions, Stomp damage, etc). While not the primary difficulty of the third Phase, Amber Globules are the most basic addition to this fight in Heroic difficulty, and do increase the challenge and lower raid DPS by a decent chunk to boot. Every 33 seconds during Phase 3, a pair of Amber Globules will spawn, one each from a random corner of the room where the very large, static amber pools reside. Each Globule fixates on a random player upon spawning and cannot be attacked, snared, or controlled in anyway. If the Globule reaches melee range of the targeted player, it will explode and deal 600,000 Nature damage to the entire raid, easily causing a wipe. However, the Amber Globules move at a fairly slow pace, and if any two Globules cross into melee range of one another, they will harmlessly dissipate and despawn. Since the four spawning pools in each of the corners are equidistant to the center of the room, there is a simple scheme by which players can force Globules to pass through one another and despawn. The player pursed by Globule from corner “B” moved opposite to the Blue marker, and the player chased by Globule “A” moved to the Purple marker. Unfortunately, there is one small kink in this method: Globules do not spawn at exactly the same moment, but instead spawn 2-3 seconds apart. This means, in the above example, the Globule from “B” going along the Blue line was the first spawn, and thus travelled the equal distance from the spawn to the central crossover point at the same speed as Globule “A”, but since it spawned first, it arrived before Globule “A” and thus they did not crossover at the same moment and despawn. 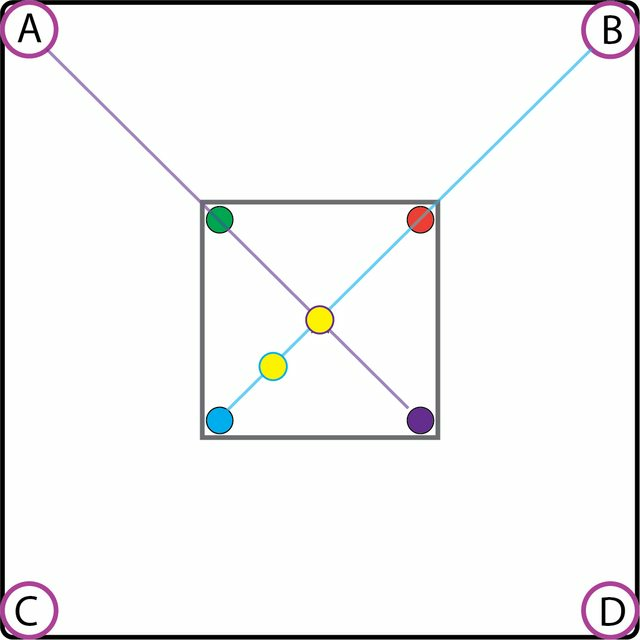 As we move the crossover point (now at the green raid marker location) closer to point “A”, the segment (AC) becomes shorter while the segment (BC) becomes longer. Since the Globule from point “B” was the first spawn, we want it to travel the longer distance of the two Globules, thus we adjust our crossover point “C” to be around the raid marker near point “A” (where the second-spawned Globule appears). This can be accomplished easily by forcing the player that has the first-spawned Globule (from point “B” along the Blue line in this case) to move to the close raid marker corner where the second-spawned Globule originated, while the player targeted by Globule “A” remains in the center of the room with the raid (and thus attacking Un’sok still). 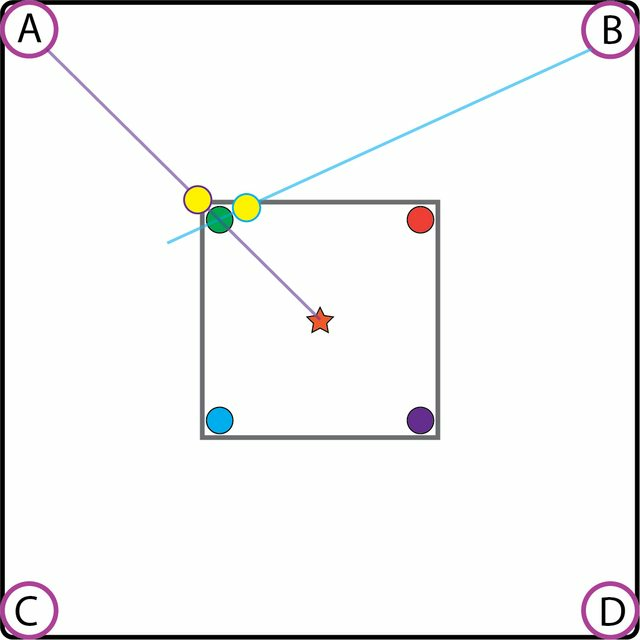 This means while our first-selected player moved out to the Green marker location, the Globule from point “B” is still clearly moving toward the center position, which immediately indicates that the Globule from “B” is actually the second-spawned Globule, and therefore our first-selected player should quickly move over to the Red marker nearest to point “B” to remedy the situation. The good news is that since paths were kept straight until this point, very little is lost in this transition mistake, and only slight adjustments may be necessary to force the Globules to cross. While the Amber Globules are the only direct addition to Heroic difficulty for Amber-Shaper Un’sok, another major factor in Phase 3 is the basic DPS requirements for the raid. Consider that Amber-Shaper starts to enter Phase 2 at 70%. If no other methods are used to delay his immunity gain (more on this later), he’ll likely become immune and enter Phase 2 around 65% health, or 221,000,000 hit points. If Phase 3 on Heroic is treated like Phase 3 on Normal and there aren’t any Amber Pools stockpiled to utilize, we can determine fairly easily how long it will take a raid with any given Raid DPS to kill Un’sok during Phase 3 using this spreadsheet. While an actual formula to figure this out is far beyond my mathematical skills, the spreadsheet does the same job fairly simply. So in the baseline example with a raid of 650,000 DPS, if Un’sok has no Destabilize stacks entering the phase, it will take approximately 2:15 seconds to kill Un’sok. This is a generous assumption of DPS however, given that almost constantly, there will be Globules that must be managed in addition to the excessive healing that will occur. It also assumes the maximum Destabilize stacking of 6 per Constructed player during this final phase (Reshape Life is cast every 15 seconds during Phase 3 just like Normal difficulty). However, 133k DPS is about 57% higher than what a normal DPS player would deal in a raid that does 650,000 Raid DPS, so this assumption in the calculation is probably a reasonable balance to counteract the issue with dealing with Globules (since Globules don’t chase Constructed players). While it is theoretically viable to treat this like Normal difficulty and not plan ahead for Phase 3 to meet this high DPS requirement, it is highly unadvisable. Over 2 minutes is a very long time to spend in Phase 3 and many issues will arise. For one, due to the incredibly high damage dealt to non-Construct players, targets of Parasitic Growth are very likely to die prematurely during this phase simply because the healing requirement forces the damage too high very rapidly, even with cooldowns. Additionally, without planning ahead and saving Living Ambers specifically for this final Phase, Constructed players will invariably die after their 38 second lifespan, dropping the raid numbers down rapidly. However, if your raid can save a few Living Ambers, on Heroic during Phase 3, each Consumed Pool restores 50 energy instead of the normal 20. This is the most basic strategy to be used for Heroic, and therefore starting out with this method or some form of it will prove the easiest stepping stone to get deep into the fight and start learning the mechanics. The basic idea is simple: The raid destroys every set of four Living Amber as it spawns, allowing the new Construct from the most recent Reshape Life to Consume all four Pools. Meanwhile, regardless of the Phase that is active, the Constructed player should focus all Amber Strike attacks on Amber-Shaper Un’sok. One big advantage to this strategy is this method is very easy to perform. Killing Living Amber as they appear without concern for the timing of Consuming the Pools as well is very simple and straightforward. Similarly, completely ignoring Construct energy mechanics means the raid never has need to worry about how well a Construct manages his or her energy or abilities, so long as Destabilize is maintained on Un’sok and the DPS ensure each Construct is pushed below 20% at some point. Another key factor for this method is that it allows the raid to enter Phase 3 with a very high Destabilize stack on Un’sok. If it is maintained throughout the fight, he will fall over so fast the mechanics and healing requirements of Phase 3 will be completely irrelevant to the raid. Thus an average raid will need to sustain about 690k DPS during the 5-minute Phase 2 to kill the Monstrosity in time. However, remember this DPS requirement is for all targets in total. Damage can be compartmentalized such that it is more efficient, so perhaps 1-2 people killing Living Amber spawns, 2-3 people on the Construct, and 2-3 on the Monstrosity. It must also be remembered that invariably one DPS will be contributing virtually no DPS throughout most of the Phase as he or she is within a Construct, and therefore dealing no damage due to Amber Strikes on Un’sok. While Amber Explosion cooldown has greater than 20 seconds remaining, Amber Strike Un’sok on cooldown as normal. When the Amber Explosion cooldown is between 13 and 20 seconds, cast Amber Strike on Un’sok one time anywhere in that window, then halt in preparation for the final Strike. Now, Amber Strike Un’sok one last time when the Amber Explosion cooldown is as close to 6 seconds as possible. During this Amber Strike cooldown, establish the Monstrosity as the target and get in position. The moment the Amber Explosion is cast, Amber Strike to interrupt it of course, then re-target Un’sok and reposition on him. While it is close, with this method there is a 2-3 second margin of error to re-apply Destabilize on Un’sok before the stack expires. This strategy is a great way to get into the fight deeper and see how things work on Heroic, but the DPS requirement is quite severe. However, due to the control allowed to the raid, there will be very little during both Phase 1 or Phase 2 that can be considered dangerous. For this reason and to assist with the DPS requirement, it is highly advisable to utilize a 1-healer method with this strategy. With proper raid cooldowns from the solo healer, hybrids, and the tank(s) for the final Phase 3 damage influx, survival should be reasonably sustained at the end. The only danger to 1-healer is if the healer becomes a Construct during Phase 2, at which point tanks should blow CDs to survive and self-heal while a similar CD should be used on the active Parasitic Growth target if possible. While it presents a number of potential challenges and takes some practice to properly manage all the timings, this strategy makes a tradeoff between lowering required raid DPS to instead greatly increase healing requirements and slightly increase Construct difficulty for a single, designated player. The basic goal is simple: Maintain a sustained Destabilize stack on Un’sok throughout the encounter so Phase 3 is very short, but do so by allowing a single tank to remain within his or her Construct throughout all of Phase 2 in order to sustain said Destabilize stack on Un’sok. This is done by “saving up” a number of Living Amber spawns that are not consumed during Phase 1. The number that must be banked or saved is based on the Raid DPS and thus how long the Monstrosity will take to kill to finish Phase 2, but since this strategy doesn’t inherently keep Destabilize stacked on the Monstrosity, it will require a large number of banked Living Ambers to be saved (likely 16+). Experimentation will be necessary of course to see how many your raid needs. During Phase 1 with this method, the tanks should take turns while Constructed to Consume all Pools that are active until the raid needs to start saving up. Once saving begins, each tank must Consume 1 pool only during his or her Construct phase, which will give them enough energy and time to be able to keep Destabilize active long enough for the next tank to refresh the stack when he or she becomes Constructed. Living Amber should continue to be killed as they spawn (either fresh ones or respawns) as the damage they deal while alive adds up quickly. Once enough Living Amber are saved up, the raid should push Un’sok over 70% and transition into Phase 2 when Reshape Life has about 30-40 seconds remaining. Any later or any sooner and eventually, the timings of Reshape Life casts during Phase 2 will not line up properly with the Monstrosity’s Amber Explosion cast, meaning an interrupt will be impossible. Meanwhile, the tank that was a Construct going into Phase 2 remains a Construct for the rest of the fight. This player is the only Construct allowed to Consume Pools and otherwise he or she will focus solely on keeping Destabilize stacked on Un’sok in preperation for Phase 3, while the rest of the raid deals with the new Construct players quickly and kills off Living Amber for the tank to Consume. The other big change with this strategy is since one tank is a Construct full-time, when the Monstrosity uses Grab and Fling to throw the current tank on a random raid member, it causes the Monstrosity to lose threat temporarily for about 5-6 seconds and attack the next highest threat target. There are a variety of methods to deal with this, but the safest is to have a taunt-capable player taunt the Monstrosity as soon as Grab is cast, forcing the Monstrosity to melee attack that player for 3-4 swings until the primary tank can re-taunt. Un’sok, however, retains threat on the Flung tank and is not a concern. The best thing about this method is that in addition to not requiring very high DPS to meet the requirement and allowing a high Destabilize stack on Un’sok for Phase 3, for the majority of the raid, this strategy is almost identical to how Normal Difficulty is handled. All normal Phase 2 Reshape Life targets should focus solely on attacking the Monstrosity and never need worry about Consuming Pools or doing anything other than Amber Striking the Monstrosity and interrupting the Monstrosity’s Amber Explosion cast. The biggest drawback to this method is the sheer number of Living Amber that must be saved up during Phase 1 to allow the tank Construct to remain active full-time. Also remember, you can’t simply let them die and res to fix the issue, since the Construct remains active if someone dies from energy loss and will have a ton of HP due to all the Consuming that occurred. To alleviate this issue if practicing this method, find opportunities to focus DPS on the Monstrosity as much as possible -- assign only a handful of DPS to deal with Living Ambers and the non-tank Construct killing if possible. Non-tank Constructs should also focus on getting the Destabilize stack as high as possible on the Monstrosity while they are active. 6 Destabilize stacks should be possible during a single Construct lifespan. This is the strategy that our raid ultimately settled on and it is basically identical to Strategy 2, except it requires much greater difficulty for the tank-Construct but also reduces the healing requirement, DPS requirement, and number of necessary “saved” Living Ambers. Performing this strategy is much like Strategy 2: During Phase 1 tanks Consume all Pools until we’re ready to start saving up Living Amber. With our DPS, we found that saving up 10 Living Amber was a reasonable number. This meant that the process of saving starts 3 Amber Scalpels before we’re ready to push into Phase 2. On the first Amber Scalpel, our tank Consumes 1 Pool to sustain Destabilize on Un’sok. The second Amber Scalpel, the second tank does the same drinking only one Pool. Then finally after the third Amber Scalpel, when our first tank is Reshaped a second time, we’ve got our 10 active Living Amber saved up and can push the boss into Phase 2. Once in Phase 2, the tank-Construct has the tricky job of sustaining Destabilize on both Amber-Shaper Un’sok and the Monstrosity. With a 6-second cooldown of Amber Strike and Destabilize lasting 15 seconds, this means there is only a 3-second margin of error or window where the player can be not casting Amber Strike even when it is available. This gap is large enough to easily maintain both stacks throughout, but the tank-Construct must be very mindful to use Amber Strike on cooldown, and use the time spans between Amber Strike cooldowns to run out to Consume Pools between about every other Amber Strike cast. As with Strategy 2, any strategy that allows a single player to remain a Construct and handle Destabilize on Un’sok makes Construct management for the rest of the raid very simple. Moreover, by keeping the Destabilize stack climbing on the Monstrosity, Phase 2 will go by extremely quickly and again, Un’sok will have a high Destabilize stack as well entering Phase 3 to burn him down fast at the end. As mentioned this requires the tank-Construct to juggle Destabilize between two targets which can be very tricky and takes practice. Macros to help targeting or casting on the two bosses can be quite useful. Additionally, when Fling occurs, it will force Un’sok to run off and chase the boss tank to their target destination. This movement must be watched closely by the tank-Construct and planned around so a boss target does not get out of melee range accidentally when Amber Strike is available and should be used. To help alleviate this, we found it best to keep most of the raid near the central “indentation” area of the room so travel distance would be minimized for the tank-Construct no matter what. Our boss tank also tried to keep both bosses in the very center of the room at all times to assist with this as well. This strategy is nearly identical to that of "Strategy 3: Sustained Tank-Construct, Destabilize Un’sok and Monstrosity" except as indicated, the raid utilizes 3 tanks instead of the normal 2. The addition of a third tank provides much more stability for Phase 2, at a very minor loss of potential raid DPS by replacing a previous DPS slot with a tank. Our raid found this method much easier to consistently progress far into the encounter and would be highly recommended for any raid with 3 strong tank-capable players. The first major benefit to a 3-tank method is it eliminates the need for any bizarre tactic to handle the Grab+Fling combo on the boss tank during Phase 2. In our case, we had our Holy Paladin taunting the Monstrosity to soak hits during Fling, which while workable, is far from ideal and would often lead to scary situations. Instead, the Monstrosity of course can be taunted by the second tank the moment Grab is cast, eliminating all dangerous damage spike situations almost entirely from Phase 2. Tank A is holding Un'sok and Tank B is holding the Monstrosity. As soon as Tank B has Grab cast on him or her, Tank A taunts the Monstrosity. Tank A now holds Un'sok and the Monstrosity while Tank B flies off into the nether. Once Tank B is back in the center position, if Tank B taunts the Monstrosity back, the next time Grab is cast, Taunt diminishing returns may not be reset, and this will cause an issue. Therefore instead, Tank B should taunt Un'sok on him or herself. Now on the next Grab/Fling, which will be cast on Tank A, Tank B then taunts the Monstrosity, after which point Tank A taunts Un'sok back, and the process repeats itself. Throughout the entire process, the mobs should never move from their central positions. The biggest downside to a 3-tank method is that because of the randomness of Reshape Life selection during Phase 1, there is no reasonable way to force a specific Construct tank for Phase 2. Therefore, all three tanks must be willing and able to take on the permanent Construct role for Phase 2 since it will not alternate between two targets as when there are only two tanks. That said, if only 2 of your 3 tanks are strong Construct controllers, this is manageable, by remembering that Reshape is never cast on the same tank twice in a row. So with some luck, DPS can be held and Ambers saved and managed such that you wait until the "bad tank" is Reshaped, and then the following cast of Reshape will be the transition cast after which to push into Phase 2. This is the scenario if only one of your tank players is a valid permanent Construct for sustained Destabilize stacks in Phase 2, meaning the other tank is unable to reliably maintain the stacks for whatever reason. In this case, there are two possible Phase 1 timings that should be planned for. For this explanation, we’ll refer to the intended Tank-Construct player as the “Contank” and the other player as the “Offtank”. Immediately after Reshape Life is cast and the target is noted to be the Contank, all DPS on Amber-Shaper Un’sok should halt, likely stopping his health around 95%. From this point forward, no damage should be directed at Un’sok save for Amber Strike from the current Construct, as well as Smash (auto-attack) damage from the same. To lower overall DPS, the tanks should get in the habit of facing Un’sok while using Amber Strike on cooldown every 6 seconds, but during the Amber Strike cooldown, turn and face away from the boss, preventing unnecessary Smash auto-attack damage for ~5 seconds out of every 6. With the first Reshape Life cast on the Contank, the raid should plan to have enough Living Amber and the boss health just above 70% shortly following the fifth cast of Reshape Life. Since the first Reshape Life was on the Contank, the fifth cast is the earliest possible moment where the number of Living Ambers will meet the goal of 11 saved while also allowing Amber-Shaper’s health to be low enough to push the transition. First, DPS halts on Un’sok once Reshape Life is cast and is noted to target the Contank. During Reshape #1, the Contank Consumes all 4 Pools, while DPS focus the Construct down, allowing the Contank to exit the Construct near the end of the Scalpel cast as convenient. During Reshape #2, the Offtank Consumes only 3 Pools, leaving one behind on purpose, and again exits near the end of Scalpel. During Reshape #3, the Contank Consumes 1 Pool only, leaving 3 extra behind for a total of 4 saved at this point. During Reshape #4, again the Offtank Consumes only 1 Pool, saving another 3 Amber and bringing the total saved up to 7. Finally, around 5-15 seconds after Reshape Life #5 is cast on the Contank, the DPS can resume attacking Un’sok, who should be around 75% health at this time, and transition him into Phase 2 while ignoring the Contank’s Construct. The Scalpel that proceeds this final #5 Reshape will create the final 4 saved Living Amber, putting the total saved Amber at the magical 11 mark. It’s worth briefly noting that to sustain a current Destabilize stack on a single target, it is necessary for any Constructed player to Consume a minimum of 1 Pool while below 80 energy. However, the timing can be tricky and should be thought about ahead of time for tanks during Phase 1. When Consuming only 1 Pool, a tank should spam Amber Strike like normal. However, once Amber Scalpel begins to cast, the tank should look to use one final Amber Strike to refresh the duration to 15 seconds. This Amber Strike should ideally be used around halfway through Amber Scalpel (with about 5 seconds remaining). This extends the duration of Destabilize and the follow-up Construct refreshes the stack as normal. In this situation, DPS can generally continue on Amber-Shaper throughout the phase, as the planned transition into Phase 2 will occur following Reshape #4. The basic step-by-step is much the same as when Reshape #1 is cast on the Contank, but it starts one Reshape cast later than normal. During Reshape #1, the Offtank Consumes only 3 Pools, leaving one behind on purpose, and again exits near the end of Scalpel. During Reshape #2, the Contank Consumes 1 Pool only, leaving 3 extra behind for a total of 4 saved at this point. During Reshape #3, again the Offtank Consumes only 1 Pool, saving another 3 Amber and bringing the total saved up to 7. Finally, around 5-15 seconds after Reshape Life #4 is cast on the Contank, the DPS can transition Un’sok into Phase 2 while ignoring the Contank’s Construct. The Scalpel that proceeds this final #4 Reshape will create the final 4 saved Living Amber, putting the total saved Amber at the magical 11 mark. Everything else is the same as before, so watch the DPS carefully and ensure Un’sok will not be approaching 70% too soon prior to that 5-15 second mark into the #4 Reshape Life cast. In this situation, since both tanks are able to be the permanent Construct for Phase 2, then the order of Reshape Life casts becomes irrelevant, and the only important thing is the timing of the transition and the Living Amber savings. Therefore, the raid can always use the example from "Reshape Life #1 Cast on Offtank" where Reshape Life #1 is cast on the Offtank and can therefore continue to DPS the boss, planning for the transition after Phase 2 to occur following Reshape #4. Since the ultimate goal for the Constructed player is to maintain both Destabilize stacks on the Monstrosity and Un’sok, this player should do everything he or she can to plan ahead and make this role as simple as possible. 1. Remove unnecessary UI clutter. Many people often have one or more bossmods running, which by default provide a huge amount of information. Often this information is overwhelming and actually hinders the player, so especially in this scenario as the Construct tank, such addons should be customized to suit the needs of the player and eliminate anything that can be distracting or misinform the Contank. In my case, I enable only one bossmod for this fight, and turn off all warnings for it except for the key things I want to know about: My own Amber Explosion from my Construct and the approximate cooldown of the next Grab/Fling combo since that will affect the movement of the bosses. Additionally, it is highly useful to zoom the camera far out to allow a large overview of the room to easily see where Pools and the bosses are positioned, as well as have an easy way to remove nameplates once Phase 2 has begun, to eliminate UI clutter. 2. Add or improve upon vital UI elements to assist in the Construct role. When he is casting Amber Explosion and thus must interrupt himself with Struggle for Control. What his current energy/Willpower is at and therefore when he's below 80 and can safely Consume a Pool. What the Destabilize duration is for Amber-Shaper Un’sok. What the Destabilize duration is for the Amber Monstrosity. For readability, it is best to cluster this information together as much as possible so it can be glanced at quickly in combat. I place my Willpower, and both Destabilize timers near my unit frame, along with the approximate cooldown of my Amber Explosion. I also have a very pronounced warning to make absolutely certain I know when I’m casting Amber Explosion and should interrupt myself in the form of a custom WeakAuras Display. 3. Allow simple targeting between the two bosses. This can be accomplished a variety of ways, from making macros to target the bosses, to using boss unit frames to click and target them, to actual macros that cast your Amber Strike at the appropriate target for you provided you’re in range. In my case, I created two simple /target macros to uniquely target either Amber-Shaper or the Monstrosity using an easy-to-press key combination (Shift+1 and Shift+2 respectively), then tied that information into my UI displays as mentioned above to remind myself if needed. Therefore, my timers that display the Destabilize duration for Amber-Shaper and the Monstrosity are color-coded slightly different and have text to remind me that S1 (aka Shift+1) is Un’sok and S2 (Shift+2) is for the Monstrosity. Thus I can at-a-glance see which bar is the lowest if I’ve forgotten which target I last cast on, and hit the corresponding hotkey for my target to land the next Amber Strike as needed. 1. Keep energy as high as possible at all times. If your raid properly saved 11 Living Amber going into Phase 2, as long as the Construct tank sustains the Destabilize stacks on the Monstrosity throughout, DPS will be plenty high enough to get through Phase 2 before the Living Amber reserves run out. To ensure energy never becomes an issue, however, as the Construct tank it is best to always keep your energy as high as possible without ever Consuming a Pool when energy is above 80. This is best accomplished by Consuming a Pool very frequently, ideally after every 1-2 Amber Strike casts, anytime you’re below 80 energy. This provides an emergency “reserve” of energy in the event that a pool isn’t within reach in that 6-second cooldown window between Amber Strike casts, without worry that energy will run dangerously low. In such cases, the Construct can simply remain near the bosses for Amber Strike usage until the next cast to follow, and a Pool is in a better position. Maintaining high energy reserves for that emergency stockpile also ensures the Construct will survive long enough should an Amber Pool not exist for a brief period while DPS are trying to kill off new or freshly respawned Living Ambers. 2. Predict the bosses’ movement. This is primarily about watching the timing of Grab/Fling as well as communicating with the rest of the raid when these events are due or occur. When Fling is happening, watch the area around you to see which direction the Flung player is being thrown to and preemptively move in that direction so your next Amber Strike is not delayed if at all possible. Construct travel distance issues can also be largely alleviated by ensuring the raid maintains a fairly tight position throughout Phase 2. The Offtank(s) handling the bosses should try to stay as centered as possible at all times while the raid members should stay within the central indentation area below the stairs to keep Amber Pools easily accessible. 3. Target the next Amber Strike target sooner rather than later. This is just a good practice to get in the habit of, but the idea is simple: Find a pattern that is easily repeatable that forces you, as the Construct, to cast the next Amber Strike on the appropriate target every time. For me, this meant that as soon as I cast Amber Strike, I immediately used my opposite target macro to target the other boss as moved around to Consume Pools and get in position. This makes it easy to spam Amber Strike as soon as the cooldown is ending without worry about whether the target is correct. By having that next target pre-selected as soon as possible, it allows the actual target frame to serve as a reminder about which boss is next and therefore which needs to be in melee range for the upcoming Amber Strike. 4. Plan Pool Consumption paths ahead of time. At all times, but especially as Amber Strike is coming off cooldown and is about to be cast, the Construct player should be looking around at which Pool(s) are within reach and convenient to Consume next. If Energy is low enough to do so, planning a path to Consume 2+ pools during one 6-second Amber Strike cooldown period is even better and highly efficient. Last edited by Kulldam; 02-04-2013 at 11:50 PM. Note: Some of these Displays perform the same basic functions in different ways, so edit/disable them as you see fit. If you receive this error trying to import, this is due to a known bug in the LibCompress library used by WeakAuras to shrink serialized text strings used for imports and exports. To resolve this, you must make the following simple adjustments to your WeakAuras installation to bypass compression. These steps will not harm your WeakAuras installation or functionality -- this will simply allow your WeakAuras to import uncompressed strings, which are typically 80% larger than compressed strings but otherwise no different. 6. Once you've added the extra line of code as seen above, Save the Transmission.lua file to write the changes that were made. 8. Now import the Display in WeakAuras as normal. 9. Once the import is complete, you must revert the changes to Transmission.lua. 11. Save the Transmission.lua file again, reload your interface in WoW, and everything will be back to normal. 8. Now export the Display in WeakAuras as normal. 9. Once the export is complete, you must revert the changes to Transmission.lua. Last edited by Kulldam; 02-05-2013 at 04:47 PM. Ah bummer; it appears to be a known issue with the LibCompress library that WeakAuras uses for strings when dealing with very large imports. I've updated the post with information about how get around the error temporarily. thank you kulldam it worked like a charm!